OVERLAND PARK, Kansas – Butler Creek, maker of smart, field-proven hunting and shooting accessories, announces the new ASAP Magazine loaders are now available. Come see them and learn why “Shooting USA” host John Scoutten has chosen these loaders as his go-to option at the Vista Outdoor booth (#2542) during the 2017 NRA Meetings and Exhibits Show in Atlanta, Georgia, April 27 to 30. 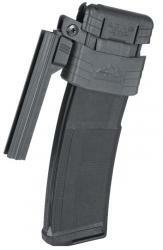 Available in Universal Single Stack, Universal Double Stack, AK-47/GALIL and AR15 magazine configurations these loaders are extremely easy to use and provide speed and relief from “shooter’s thumb.” The Universal Single Stack and Universal Double Stack ASAP loaders work with a large majority of common magazines between 9mm and .45 ACP (including .380 ACP for the Double Stack Loader). The ASAP Universal AR15/M16 Mag Loader offers three ways to load MSR magazines—and none involve the user’s thumbs. Loose ammo can be loaded one round at a time with a simple click into place. Consumers can try the new loaders at the 2017 NRA Meetings and Exhibits Show in Atlanta, Georgia, April 27 to 30. Butler Creek brand ambassador John Scoutten will be on hand to answer questions. Scoutten is the producer and Emmy award nominee co-host of the Outdoor Channel’s “Shooting USA.” He also competes in multiple shooting events, including NRA Action Pistol, Steel Challenge and the Precision Rifle Series, among others. On Friday, April 28, Scoutten will host a product demonstration at 1 p.m. followed by a question-and-answer session at 1:30 at the Vista Outdoor booth (#2542). Butler Creek, a Vista Outdoor brand, serves hunters and shooters, offering high-quality accessories such as gun slings, scope covers and more. Learn more at the updated www.butlercreek.com. The site, which is being updated to coincide with the show, features product information as well as tips and a new design that is easier to navigate on all devices.